WordPress offers a huge space for creativity and flexibility when designing and developing new websites. If you are looking to start your own website, a high quality WordPress theme is what you should be looking for. Users love WordPress themes because it is painless to set up and can be used to create a website. Here are the some of the best free flexible header wordpress themes ones that will save your time from searching them. 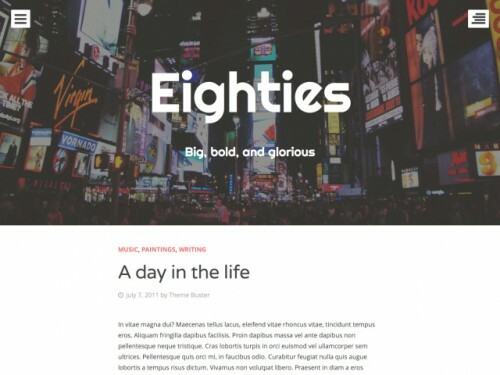 These themes will let you upload a header image of any size, even if it’s larger than is recommended for the theme. If you enjoyed the following article we humbly ask you to help us spread the word by sharing this article with your peers! Prana is a beautiful theme with simple and clean design. Theme can easily be used as a personal portfolio, simple blog or a complete business website. There is an impressive typography by Google Web Fonts without the need for load-heavy graphics. Some exciting features of Prana are custom menu, custom background, custom flexible header, featured images, widgetized sidebar, threaded comments, improved SEO performance and theme options. 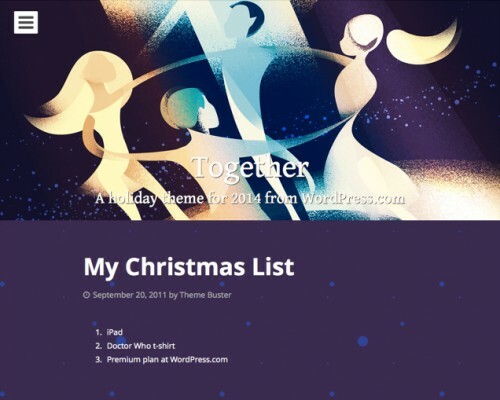 Bring everyone together around your blog for the holidays, with Together. It’s a bold, one-column theme for your personal blog with a featured illustration by Mads Berg. Post Formats and Sticky Posts are accented with larger images and different background colors to set them apart from the rest of your content. 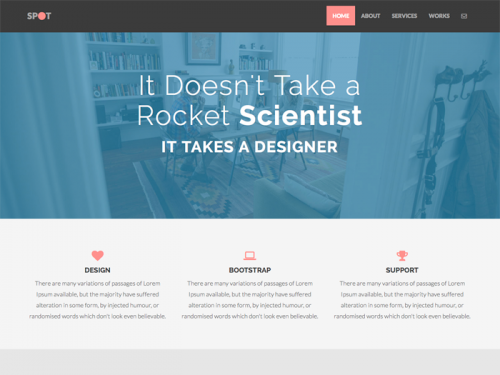 Formation is a full-width, fully responsive and highly customizable WordPress Theme. Add your own logo, header, featured areas, social media links and much more. This versatile theme also has several different layout templates that look great on devices of all sizes. This theme is WPML compatible. The Spot theme is a child theme for Flat Bootstrap. The site title is displayed in the navbar, so you still retain your site branding. It automatically adapts for desktops, tablets, and phones. It is based on the standard WordPress starter theme (_S) and the Twitter Bootstrap CSS framework. The theme was inspired by the HTML/CSS themes from Blacktie.co and color schemes from Designmodo.com’s flat UI. 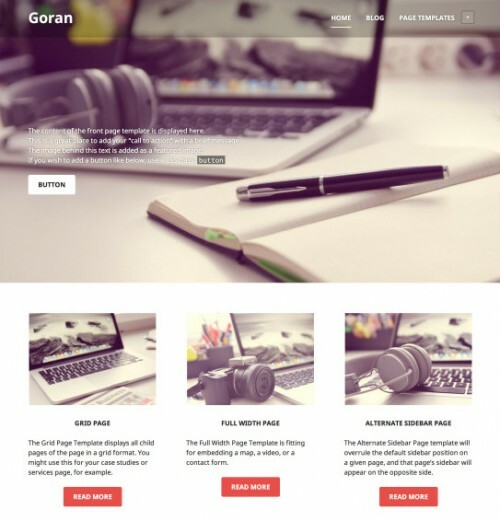 Adamos is a Free, Full-Width, Customizable and Responsive WordPress Theme. This theme is a fully responsive design that automatically adapts to look great on mobile and tablet devices. Adamos allows you to add your own personal logo, header image, featured text areas and much more. Enigma is an incredibly superfine multipurpose responsive theme coded & designed with a lot of care and love. You can use it for your business, portfolio, blogging or any type of site. 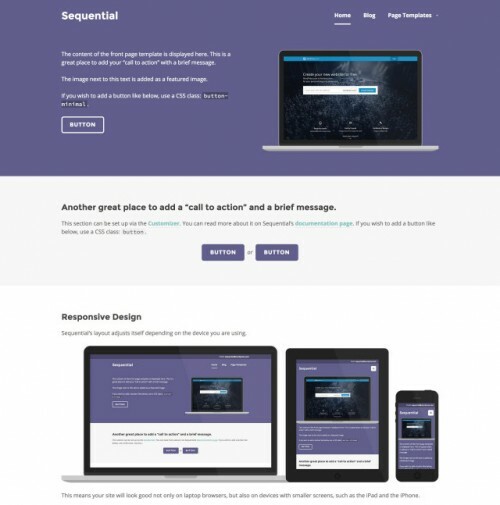 Enigma is a Cross-Browser Compatible theme that works on All leading web browsers.Enigma is Retina ready.It has 4 page layouts, 2 page templates. 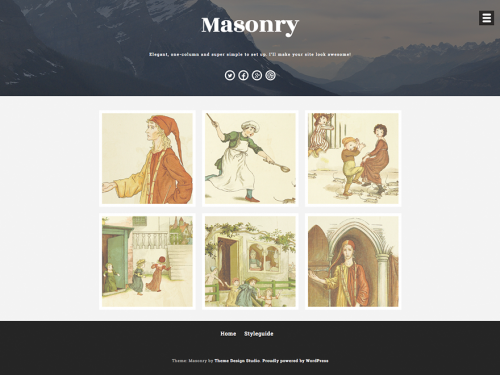 Masonry theme is based on the popular and efficient grid library, suitable for creatives, photographers or bloggers. Although its nice interface and features make it an ideal WordPress theme for almost anything, Masonry has been optimized for all devices thanks to our latest responsive, mobile-first design techniques. 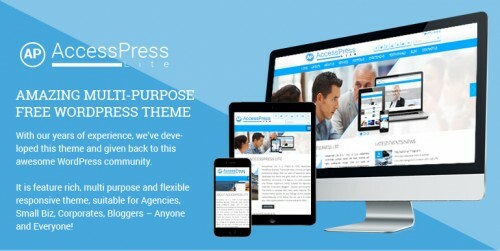 AccessPress Lite is a HTML5 & CSS3 Responsive WordPress Business theme with clean, minimal yet highly professional design. AccessPress Lite is probably the most feature rich, simple, elegant, responsive, woocommerce compatible and beautiful multi-purpose business theme with great built in ready to use features for a business website like: events, portfolio, testimonials, blog, gallery, featured posts on home page, quick contact, social media integration, easy to configure/use slider, our team and many other page layout and widgets.